Published: Jan. 5, 2019 at 10:19 p.m. Published: Nov. 16, 2018 at 01:10 a.m. Published: Nov. 11, 2018 at 06:21 p.m.
Seattle Seahawks quarterback Russell Wilson leads the way blocking for running back Rashaad Penny on a 24-yard gain. 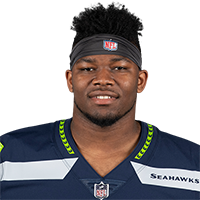 Published: Nov. 11, 2018 at 05:01 p.m.
Seattle Seahawks running back Rashaad Penny rushes for a 18-yard touchdown, the first of his career.